Happy New Year: Making Sense of Nonsense! Kids laugh 300 times a day. Adults laugh only 5 times a day! There is no scientific data to prove it, but everyone seems to believe the above numbers. Kids indeed laugh a lot, are happier and seem to have more fun than us adults. Thanks to the pressures of growing up, we often end up losing the kid inside us. 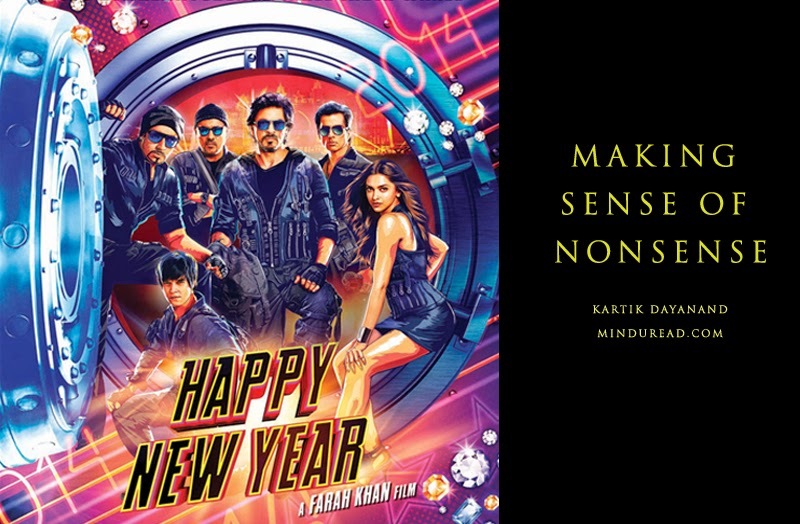 The reason I speak about kids and adults in this post is because I find it very amusing to see the extreme reactions to the latest Farah Khan movie Happy New Year. Happy New Year seems to invoke a strange phenomenon - a battle between the kid and the adult within us. By now, I am assuming you already know who you are – the one who laughed out loud while enjoying the movie, or the one who laughed reading the spoofs and reviews of critics who trashed this movie. One is the kid inside you reacting, and the other is the adult. I have made no bones about it and have been tweeting constantly about how much fun I had while watching Happy New Year. In fact I wasn't the only one; the entire auditorium was in splits. The colors, the stars, the dance, the music, everything on screen was larger than life, vibrant, happy and joyful - Happy New Year invoked the kid inside me. The primary reason why I felt that way is linked to a phenomenon called suspension of disbelief. This is a concept where no matter how unreal the happenings on screen are; for the sake of entertainment the viewer tends to believe what he sees on screen is real. Magic tricks, works of fiction and movies are a part of the same process. This is what makes us believe that Batman and Superman exist when we see them on screen. Suspension of disbelief helps us become kids once again - bringing in innocence, wonder, joy and gay abandon out of seemingly illogical and stupid things! When it comes to the universe of movies, there are certain limits we set for this suspension of disbelief based on what we already know about the movie or the filmmaker. That is where the adult in us kicks in. What we expect from a Farah Khan movie is very different from what we expect from a Sanjay Leela Bhansali movie or a Ram Gopal Varma movie. They are all set in different kinds of realities and hence our yardsticks to judge those movies change accordingly. That also explains our inherent positive bias towards some dumb Hollywood blockbusters. And true to form Farah Khan delivered what she promised in Happy New Year - a mad cap, fun, nonsense entertainer - nothing less, nothing more, all within her range of disbelief. It is not her fault if some people went in expecting to see an Ocean’s Eleven which belongs to an entirely different genre. It is a flawed assumption by the viewers and a problem entirely created by their own will; making them feel like baboons and idiots. Most film critics seem to have fallen into this trap. Their levels of suspension of disbelief are in stark contrast to what a majority of the audience seems to be willing to give this movie. To be fair, one of the most complex genres to handle is comedy. And the way Farah Khan manages to exploit the audio visual medium to maximum extent is quite commendable. Be it the way she infuses the character of Abhishek Bachchan in a setup inspired by the movie Don, or the subtitles ‘Aa Dekhe Zara Kisme Hai Kitna Dum’ when the Korean team starts their dance routine, the seven minute speech, or the opening notes of the song Kung Ku Fighting that begin much before the rooftop fight picks up steam – everything is laced with a terrific undercurrent of humor. One needs to connect the dots to make sense of what’s happening on screen. I have said this in my earlier post about Chennai Express too - one needs to use their brains to enjoy such madcap movies and not leave them at home. Happy New Year belongs to the same category. The ones complaining the most are sadly the lazy ones who refused to use their grey cells. Case 1 and 2 are purely people who are kids at heart pretending to act like adults with a capacity for only 5 laughs, and the third category, well..what can I say about them...I just pity them for blindly believing what 1 and 2 are saying. Anyways, give it a serious thought once again and try to figure out which category you belong to. When it concerns this movie, I for sure am a kid who would like to suspend all sorts of disbelief for a few hours of terrific rib tickling entertainment. I don’t care if the movie hits 300 crores at the box office or not, but I sure had my share of 300 laughs while watching the movie. Rest I leave to your good senses.